Black Diamond LiveWire Quickdraw. Black Diamond's high-end sport climbing quickdraw equipped with a keylock Nitron biner on top and a LiveWire wiregate with HoodWire Technology on the bottom. 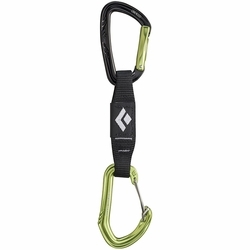 Providing a secure connection between rock and rope, the Black Diamond LiveWire Quickdraw is BD's top-of-the-line sport climbing draw with the snag-free benefits of HoodWire Technology. The LiveWire carabiner on the bottom features a simple metal wire over the nose, which allows for keylock functionality in a wiregate design. The durable, east-to-grab Vari-width dogbone also features a Straitjacket insert to keep the bottom biner properly oriented.